RV Tire Safety: How accurate is your TPMS? How accurate is your TPMS? I have also pointed out that the primary purpose or "job" of a TPMS is to warn the driver of a pressure LOSS. I am inclined to think that some are still concerned with their exact pressure reading. I also have to wonder how some people are comparing various pressure readings reported by their TPMS. If they have external sensors, the simple act of removing and replacing a sensor can allow some air to escape. While I doubt that the small loss of some air will result in a meaningful pressure differential it does add some uncertainty. So the engineering DNA in me kicked in and I a devised a plan to test 12 sensors. These come from two different companies. 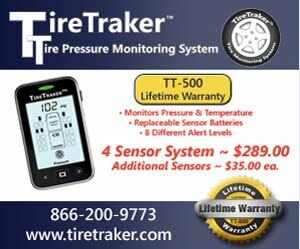 One set of 6 external sensors is from Tire Traker and one set of 6 internal sensors is from Truck Systems Technology. The question is: How do I make the test both fair and useful. I decided to eliminate as many variables as possible and get all 12 readings from the same air chamber at the same time and compare them all against my personal digital hand gauges that I have checked against an ISO certified laboratory gauge. Note my hand gauge reads to 0.5 psi which is way more precise than anyone needs for checking tires in normal highway use. Here is the test fixture I made. It has 6 bolt in valves for mounting the external sensors plus a valve for me to use with my hand gauge. Also since safety is always of concern when dealing with a pressure vessel I added a pop-off valve. One end of the fixture has a cap that can be removed so I can place the internal TPM sensors inside the 4" tube. It also has a regulated air supply to compensate for the very slow leak around the cap and an analog dial gauge that allows me to constantly, visually monitor the air pressure to ensure the use of my hand gauge does not result in a pressure change that isn't immediately compensated for by the regulated air supply. Here are the results of my comparison test. The target pressure is 80.0 psi as reported by my handheld digital gauge. I also recorded the temperature. I do not consider any of the differences in the readings of pressure or temperature to be significant or meaningful for a TPMS. I would consider the pressure readings from all 12 sensors to essentially be equivalent. You can learn a bit more about what a "meaningful" measurement is HERE.